I am very happy of that following good news and I am less sad now :The Sultan Mohammed Al-Qasimi III, of the Sharja Emirate, has declared that : to thank Egypt that gave to his country in 1953, access to education, scholarship and knowledge, he will take in charge all the restoration costs of the books burnt last week end in the oldest scientific institute of Egypt during the clashes. He will also rebuilt a new Institute. But also better : he revealed that he have all copies of the old maps that burnt totally in the Institute and that he will provide with it the new institute ! I am very happy for because then knowledge is safe. 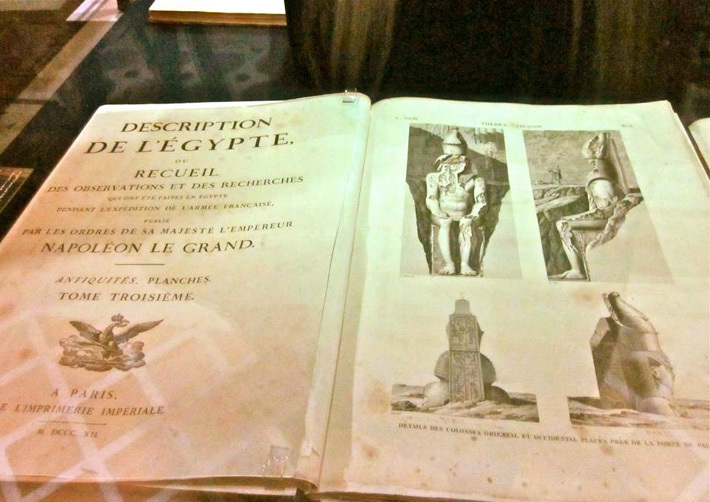 Those old maps are a mine of knowledge about ancient Egypt !.Also I am very happy to announce you and that the photo you can see up there , that there are still 4 saved originals of the « Description de l’Egypte » in Egypt and I took myself this picture of one protected Inside a bank.The originals are very tall books. So we will be missing the one burnt in the Institute of course but there are hopefully others. The sultan Al Qasimi is the current ruler of the Sharjah emirate. He has ruled Sharjah since 1972.